This is a recipe I did combining lots of vegies and Jalna Vanilla Yoghourt. (For more yoghourt recipes go to www.jalna.com.au). 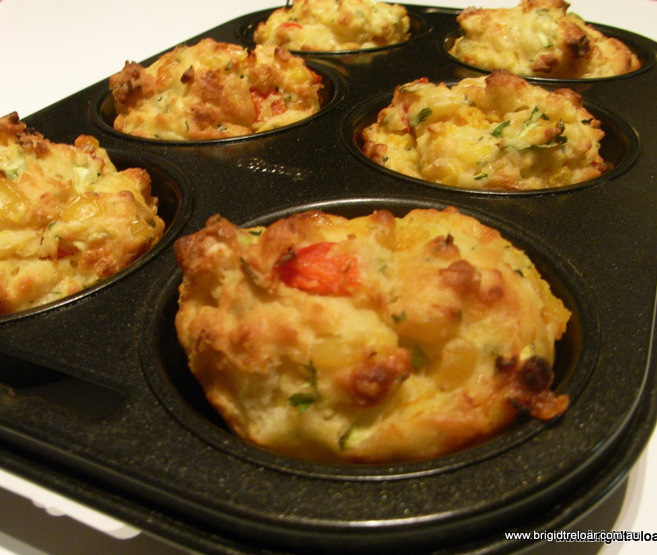 You can really use whatever vegies you want but in these savoury muffins it is a combination of diced roasted pumpkin, corn, red capsicum and grated zucchini. Not only do they look colourful but they’re quite filling, making them an ideal snack for work or school lunchboxes, or served warm as a light lunch with a green salad. The vanilla yoghurt adds creaminess with a balance of sweetness and tartness that compliments the vegies. The muffins can be frozen for a month and can easily be thawed or reheated in the microwave or oven. Preheat oven to 200ºC (180ºC fan-forced). Sift flour into a large bowl and make a well in the centre. In a separate bowl combine Jalna Yoghourt, egg and oil and whisk until well combined. Stir in cheese, zucchini, pumpkin, capsicum, corn, onion and parsley. Pour yoghourt mixture into the flour and fold in gently with a large metal spoon until just combined. Don’t over-mix; the mixture should still be slightly lumpy. Spoon mixture into a non-stick 12 hole (1/3 cup/80ml) muffin pan. Bake for 25 minutes or until golden and cooked when tested with a skewer. Stand for 5 minutes before turning onto cake rack to cool. If not using a non-stick muffin pan, spray or brush with oil or cut 10cm square pieces of baking paper and press into each muffin hole before baking to stop muffins sticking to pan. Muffins can be frozen for 1 month. You can add diced ham or barbecued chicken to mixture. Pumpkin can be boiled, microwaved, steamed or roasted but roasting gives more flavour – spread diced pieces over oven tray lined with baking paper. Drizzle with 1 teaspoon oil and toss to combine. Cook in moderate oven(180ºC or 160ºC fan-forced) for 20-30 minutes or until cooked. Remove from oven and leave to cool.